What do tasers do to the body? - asks Anonymous from Washington, D.C.
Is it true I can create ball lightning in my microwave oven? Perhaps you’ve seen a reporter who has ventured a taste of a taser’s voltage to experience crime fighting first-hand for viewers at home. One moment they’re standing up straight, microphone in hand and excited smile on their face. Next, they’re writhing on the ground making sounds not fitting for a polished reporter. How does juice from a little handheld device disrupt the body so quickly and completely? Many might think the answer is simple: The prongs of a taser send electricity directly into muscle fibers and cause them to contract uncontrollably. But that’s not the whole story. According to the website of TASER International, an Arizona company that provides electronic devices for use in law enforcement, a taser incapacitates a person by highjacking the reins of the central nervous system—the ultimate controller of our muscles. The electrical weapon, according to TASER International, overrides the brain’s control of the body by speaking the same ‘language’ as nerves. It achieves this by emitting electric pulses that match those used by neurons, which transfer information between the brain and muscles. When these nerves are flooded with pulses that are similar to their natural frequency and strength, normal signals get drowned out and muscles contract uncontrollably. The resulting collapse of the body can be thought of as a disrupted telephone conversation. Two people—representing the brain and muscles respectively—are able to have a constructive chat as long as their voices are clearly transmitted between receivers. But the smooth exchange falls apart when an intrusive third party gets on the phone line and begins to blab away. Because the meddling sound happens to be a voice, it mixes into the voices of the original conversers to prevent them from making out what the other is saying. Conversely, if the sound happened to be a rapid high-pitched squeal at the same volume, a conversation would still be able to occur—albeit under unpleasant circumstances. First generation stun devices, like the TASER TF-76 or AIR TASER 34000, were originally designed to only inflict severely unpleasant sensations without imposing a loss of muscle control. Designers hoped the stimulus would be so painful that the criminal would beg for mercy and cooperate. However, these designs proved to be ineffective against people who—out of sheer will or being high on strong drugs—have unpredictably high pain thresholds. This, along with impacting only the nerves that detect skin sensations, made physical resistance possible, showing older tasers had room for improvement. In 2001, Taser International developed its “Advanced Taser Electro-Mucular Disruption” systems, which introduced tasers with a stronger charge that reaches and synchronizes with the activity of motor nerves lodged deep in muscle tissue. With 50 to 60 pulses per second, tasers can induce sustained muscle contractions, or a tetanus. 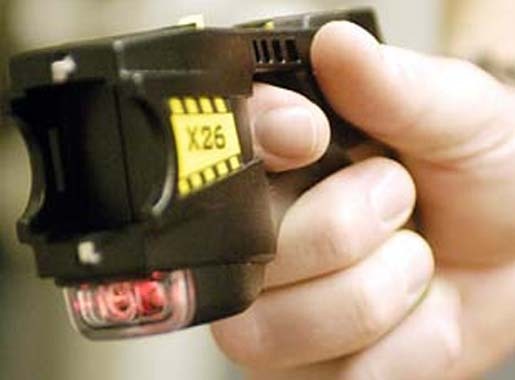 Critics of tasers, like Amnesty International and The American Civil Liberties Union, have linked these weapons to unjustifiable in-custody deaths. To investigate how tasers could potentially inflict deadly harm, researchers, mostly from the Department of Emergency Medicine at the Hennepin County Medical Center in Minneapolis, tased 34 healthy subjects for 15 continuous seconds (an exceptionally large amount to subdue someone) without producing respiratory impairments. The study, recently published in the journal Academic Emergency Medicine, lends support to the use of tasers as a safe and effective means of law-enforcement. It should be noted that Taser International partly funded the research. Yet despite the controversy, TASER International recently received an order from two federal law enforcement agencies that will add 540 TASER electronic control devices to the 11,500 already in use to combat crime in the United Sates, according to Chairman and Founder of TASER International, Tom Smith. The market for tasers has also spilled into the private sector where TASER International has marketed the ownership of the smaller, more fashionable stun-devices for personal defense. You don’t give the title of the study, or the date of its publication. You don’t state how “partial” Taser’s funding of the study was. You don’t discuss author Dr. Ho’s personal affiliation with Taser. Would have been good if the person did a better job with providing more proper or thorough citation as well as linkages for the report and, also indicating the exact amount or percentage of Taser’s funding of the research though, I agree. This piece does a terrific job of explaining how Tasers effect the nervous system, a physical reaction that is widely misunderstood. While any discussion of a weapon–advertised as a tool for self-defense or otherwise–invariably strays into moral territory, I think the piece admirably handles a sensitive topic by sticking to the science. The ‘Mr. Ho’ study is raised only to dispel a falsehood about the potentiality of “deadly harm.” While I feel more attention could have been paid to alternate studies–the drawbacks of Taser–should they exist, taking up the issue of misuse, however vital and important an element, would’ve done a disservice to the intent and focus of the article. Alexandra Schulsky: Yes, the Ho study is there to try to dispel concerns about the potentiality of deadly harm. I don’t know why you think that potentiality is a falsehood, given the number of Taser-related deaths that have been reported. MWB: You seem to have located the subject study. The study appears at first glance to have recorded Taser effects during a 15-second discharge, but on closer examination, apparently not. The critical information that should have been obtained appears to be avoided in this study: How well were the subjects able to breathe – what was the “tidal volume” of each breath – while the Taser device was being applied to them? This would show whether, as appears in videos of Taser use, the ability to breathe is interrupted while the diaphragm muscles are electrically paralyzed. Instead, the report labels as a measurement “during” exposure (“Phase 2”), a measurement taken 15 seconds after the beginning of a 15-second application – in other words, breathing immediately after, not during, the Taser application. This study appears to be of dubious value – except to Taser. Ms. Schulsky: The online article is about how Tasers work. It included a statement based on a questionable, Taser-financed study about an important aspect of that topic: Do Tasers work in a way that can kill people? The record suggests they do kill people. This is fact territory, not moral territory. The question is not whether police should use conventional firearms or Taser electrified dart guns. The question is whether police should be using potentially deadly electrified dart guns that have not been fairly tested. Surely we can agree that such use is reckless and irresponsible, and it should stop. There are other alternatives to firearms besides Tasers, and have been for centuries. Almost three years ago I was taxed nine times by the Albuquerque police department. Since than I have had sever hives. I’ve never had a hive in my life. PTSD. They never checked me out in the field for heart rate, etc. I talked to a man who had been hit in the back with a taser, even tho he was not running away. He passed out. Now he has trouble seeing out of his left eye. dots circling. Seems like there are flies in the room. He has a twitch, and some involuntary movement of his neck and shoulder. He had headaches before, and now he has headaches often, almost all the time, and some migraines so bad that he hits himself in the head to try to stop them. He was also hurt by the police while he was down on the ground. He now also has nightmares all the time. Aw, this was an exceptionally nice post. Spending some time and actual effort to create a really good article… but what can I say… I put things off a lot and never manage to get nearly anything done. simply great and i can assume you’re knowledgeable in this subject. Working in veterinary medicine, we see the occasional scary dog who’s been hit with Tasers. We see pulmonary edema, shock, brain swelling or cerebral edema, burns, seizures and death. Training in the use of any restraint or takedown method, whether it is supposed to be non-lethal or not, is critical. Even a rubber bullet or bean bag in the wrong location could be fatal.